NASA’s Parker Solar Probe – humanity’s first mission to “touch” the Sun – was today named the innovation of the year by Popular Science. The revolutionary spacecraft – designed, built, and operated for NASA by the Johns Hopkins Applied Physics Laboratory in Laurel, Maryland – launched on August 12, 2018. Just 85 days later, Parker Solar Probe completed its first close approach of the Sun, or perihelion, coming within 15 million miles of our star, exceeding the previous closest distance by 12 million miles. The spacecraft became the fastest human-made object ever on Oct. 29, when it reached a speed of 153,454 miles per hour. Three enabling technologies allow Parker Solar Probe to fly closer to the Sun than any mission before – ultimately reaching a distance of 3.8 million miles. First is the unique Thermal Protection System, or TPS; this 4.5-inch thick carbon-carbon heat shield protects the spacecraft and instruments from the intense heat and radiation of the solar environment. Second is the Solar Array Cooling System, the first active water-cooled thermal management system on a spacecraft. Finally, managing all of Parker Solar Probe’s systems while it’s near the Sun is a complex autonomy system that performs checks on attitude, temperature and other parameters, allowing the spacecraft to perform protective adjustments as needed while far from Earth-bound mission controllers. Parker Solar Probe is designed to use four instrument suites to answer decades-old questions about the Sun’s atmosphere, or corona, and the solar wind, which affects life and technologies on and near Earth and throughout the solar system. “It’s a spacecraft that will be beating records—and changing entire fields of research—for years to come,” wrote Popular Science. The first science data from the spacecraft will be downloaded to Earth via the Deep Space Network beginning on Dec. 7. During Parker Solar Probe’s seven-year mission, the spacecraft will perform a total of 24 close approaches to the Sun, with the last three bringing the spacecraft to less than 4 million miles from the Sun’s surface. At that point, the spacecraft will be traveling about 430,000 miles an hour. 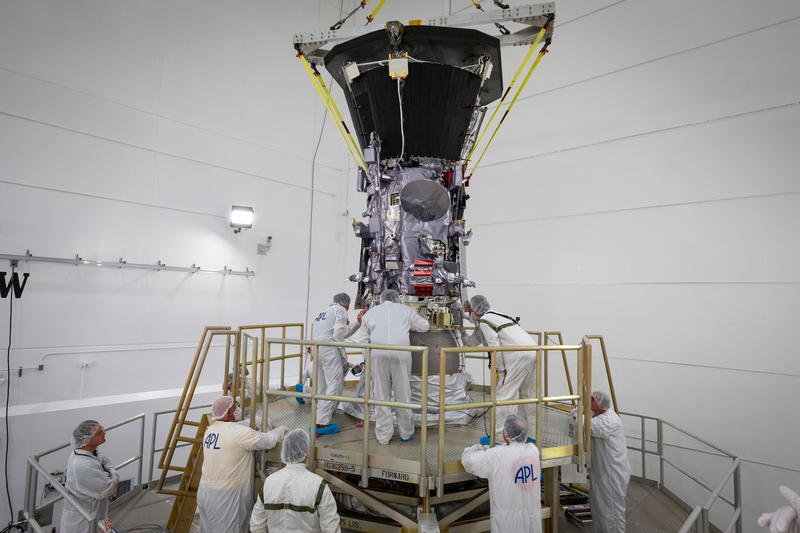 Parker Solar Probe is shown as it was mated to the third stage rocket motor on July 11, 2018, at Astrotech Space Operations in Titusville, Florida.